Let me just say it now – It’s hot. We arrived at our trulli at 10.30pm on Wednesday August 22nd after wandering through rural Italy for about an hour outside of the port city of Bari. Our GPS lady seems to pick the smallest roads possible (including one that didn’t exist) just to keep the trip interesting. We’re staying in a small gated compound which has a main residence, occupied by the owners, and two trulli, a cone-shaped stone farmhouse common in this region (more on that below). Biggest challenge for us has been the lack of an Internet connection and so far no free access in town either. We found one Internet café that has Internet access for a few Euros, but even this place doesn’t have WiFi. This has made the planning of our activities nearby quite a challenge… and some of us are running out of reading material on our Kindles. A little about our farmhouse. The trulli were first constructed in the 15th Century in this region as farmhouses. However, they were considered illegal dwellings and ordered demolished by the Duke of Martina in 1654, and the inhabitants forced to move into the nearby forest. A court challenge to this order was successful and the Count of Conversano Giangirolamo recalled the farmers and authorized the rebuilding of the trulli with the requirement that they be built as temporary structures using only dry stone. Only in 1797 was the region granted a status that permitted permanent housing to be built. By then trulli decorated this entire region. Trulli pinnacles are topped with different symbols of pagan, Christian or magical origin and some symbols are painted in white paint on the stone. With dozens of white cones dotting the rural landscape, it’s obvious we’re not in Kansas anymore. Did I mention? : it’s hot! Martina Franca is the nearest town to our trulli and we’ve had dinner in the Old Town section each night we’ve been here so far. The streets here are very narrow, not much more than alleys, so we’ve felt better parking just outside Old Town and walking the maze of streets. But we’ve seen lots of (small) cars in the maze as well. Don’t get me started on Italian drivers. We haven’t really gotten lost yet, but it would be easy to. Through an agreement with the owners, we have access to a nearby pool and we spent our first afternoon there, the boys alternating between the pool and reading our Kindles until we got too hot; Janell hogged the hammock in the shade. The pool belongs to a bed and breakfast, but we essentially had it to ourselves the entire afternoon. Very peaceful. The region is populated with lots of trees, mostly almond and olive trees. It is quite dry and we’ve seen lots of cacti, some of which sport spectacular blossoms. The evening of the 24th, the trulli owner and some of their friends from Northern Italy had an outdoor dinner party and we joined them after returning to the trulli from our own dinner in town. Several of the guests were doctors (one urologist, one ophthalmologist, and one cardiologist); the cardiologist spoke very good English after studying medicine in Los Angeles. They shared the pizza they made in their outdoor pizza oven (which wasn’t as stylish as my friend Dennis’) and one of their friends brought some fruit he grows on his nearby farm: a type of melon (similar to honeydew) and a Chinese yellow watermelon. Both were tasty. Between them, they had several kids and Aidan and Willem played soccer, basketball and Frisbee until almost midnight. 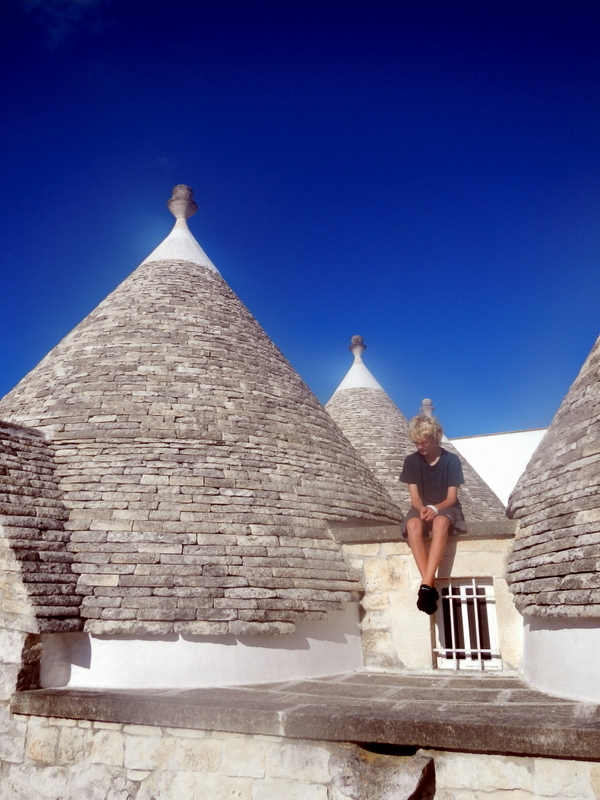 They also let the kids climb on the trulli rooftops – I guess they’re pretty sturdy. Really, I don’t think I stopped sweating even when I was in the ocean. On Saturday the 25th, we drove to a beach near Ostuni, paid our 26 EUR for lounge chairs and umbrellas, and just hung out with a quarter million Italians, most of whom stared at Aidan. I pointed out that he was probably the only pure blonde child they’d ever seen. The ocean was calm and the sandy beach was interspersed by rock formations worn smooth by the sea so people lounged on those as well as on the sand. I turned the refrigerator to the coldest setting and froze the eggs, so not everything is hot. I just hope I didn’t freeze the beer.